Hi friends. 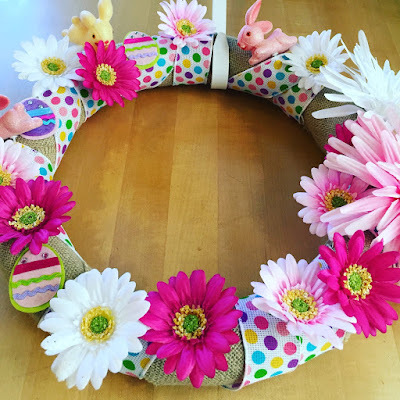 I can't believe it's already the beginning of October! 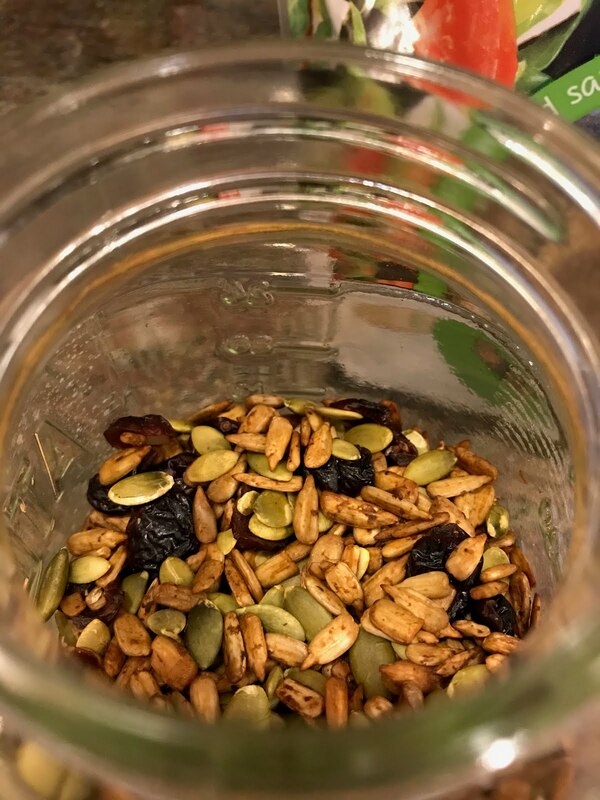 One of my favorite things to do is to shop at Costco, Whole Foods and Trader Joe's. 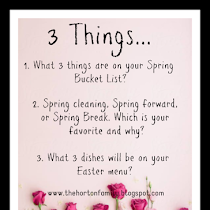 I love all three but I hate to empty the car and put everything away after a shopping trip to Costco. I like to go shopping at least once a month or every three weeks at Costco depending on what we need. When I do go I usually find something new that I'd like to try. 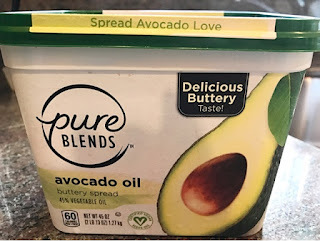 I was shopping at Costco and I tried the Avocado Oil Buttery Spread. 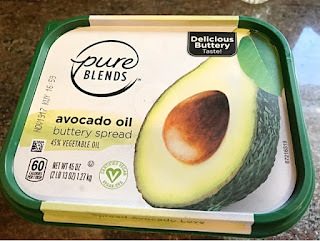 It comes in a large tub and I know that avocado oil is healthy for you so I thought I would give this a try. We liked it and I used it on my food and I cooked with it too. I will look for it again the next time I make a shopping trip there. 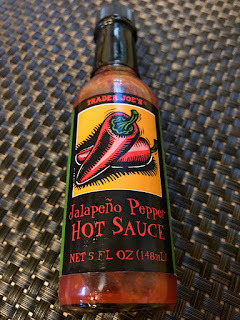 I did a blog post HERE last summer on some Costco finds and you can read about that if you like. The next thing I thought looked interesting was this Salad Topper. 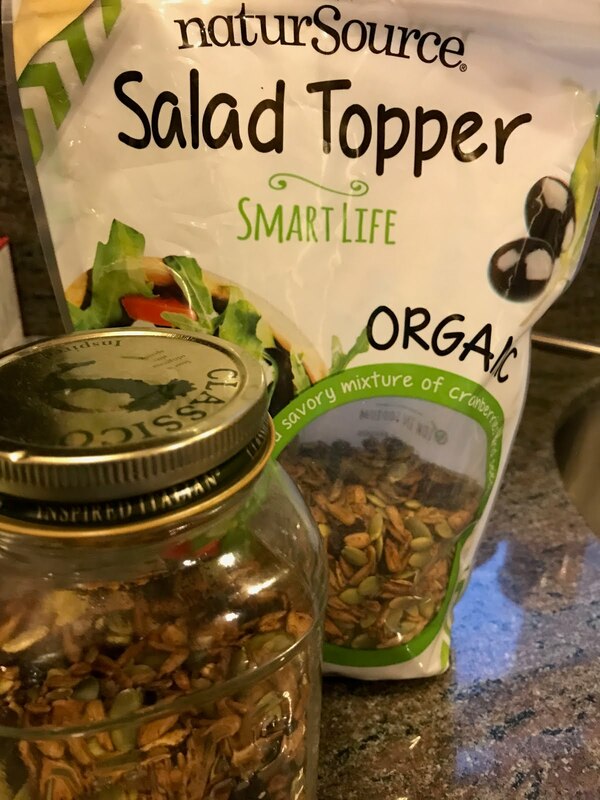 I always add one tablespoon of salad topper to my salads. This gives the salad some crunch and flavor. 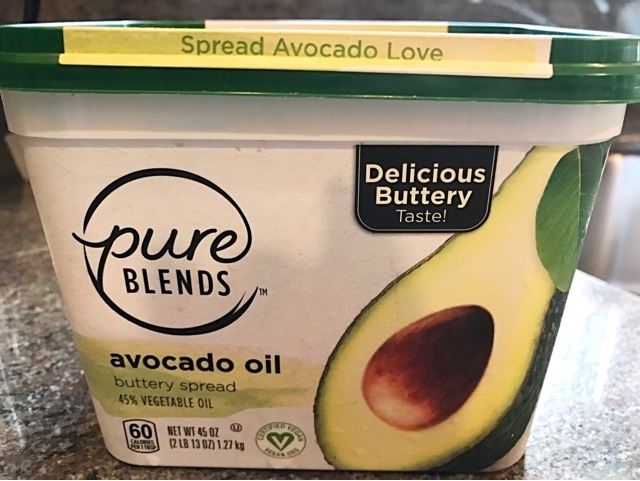 I also use two tablespoons of balsamic vinegar and two tablespoons of olive oil and a dash of salt and pepper for my salad dressing. 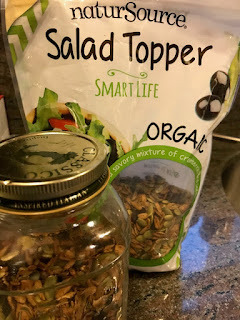 I usually take the salad topper out of the bag and empty it into a mason jar and keep it on my counter so that it's handy for me to use each night when I make a salad with dinner. Besides buying food at Costco I like to look at their clothes, socks, athletic gear, and even the jewelry section. 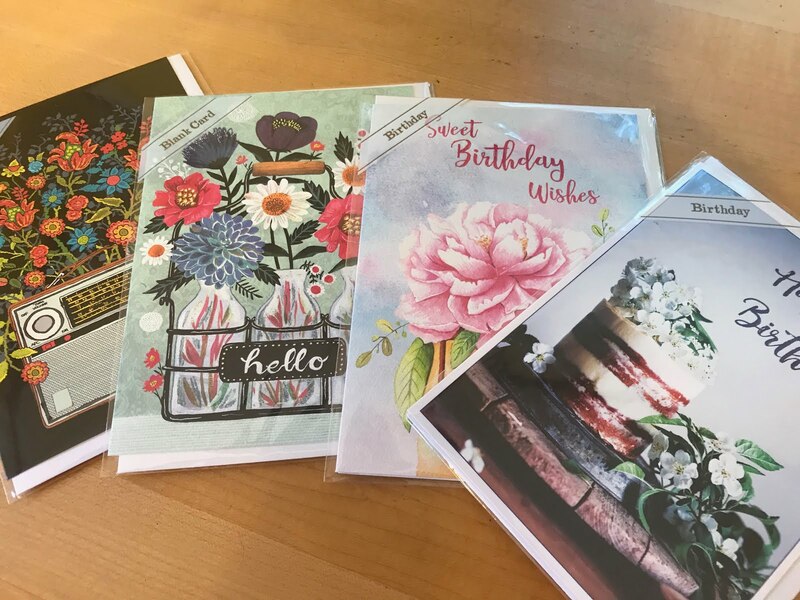 We usually visit Whole Foods like every other month. I love going up and down the isles to look for anything interesting or special that I'd like to try out. 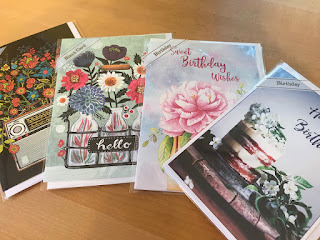 I especially love going to Whole Foods in the summer when we usually have a BBQ and invite family and friends. I love buying food in the seafood section such as fish or shrimp marinated in different sauces. They also have a fabulous meat department which we love. Last year my husband bought huge steaks to grill and they were a hit at the BBQ! 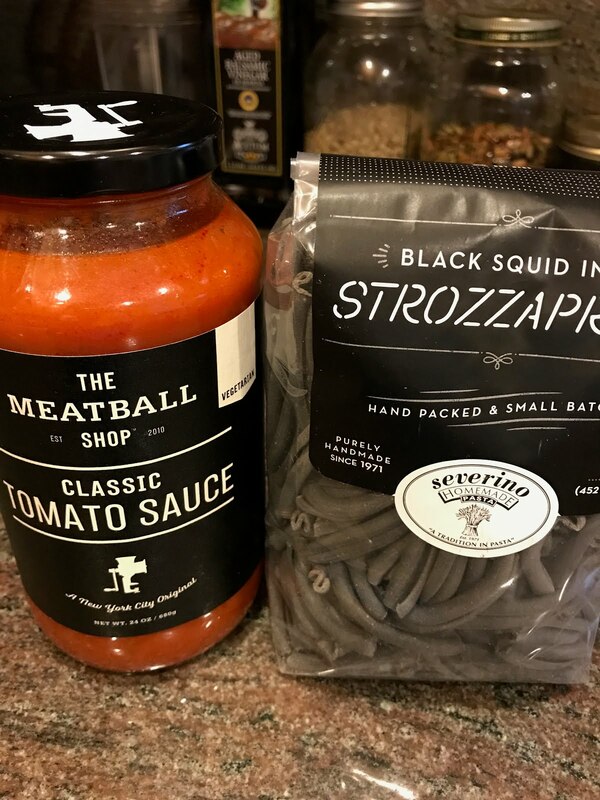 The last time I shopped in WF I found a jar of tomato sauce that was from The Meatball Shop. The Meatball Shop is a restaurant in New York City that has so many different types of meatballs to eat. 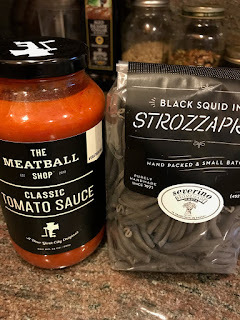 I also found black squid ink pasta that went really well with the tomato sauce from the Meatball Shop. 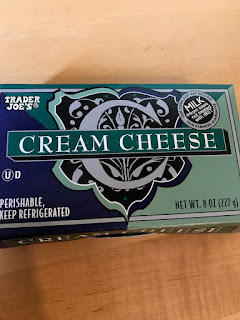 My other favorite place to food shop is at Trader Joe's. I love this store but unfortunately, it isn't close to where I live and at least a 20 to 25-minute drive. The parking is horrible as they do not have a parking lot, but I try to get there at least every other month. This is just a small amount of what I like to buy when I do shop there. I usually fill up the shopping cart all the way up to the top! I love so many things there and especially the sourdough bread and the peanut butter pretzels to name a few. 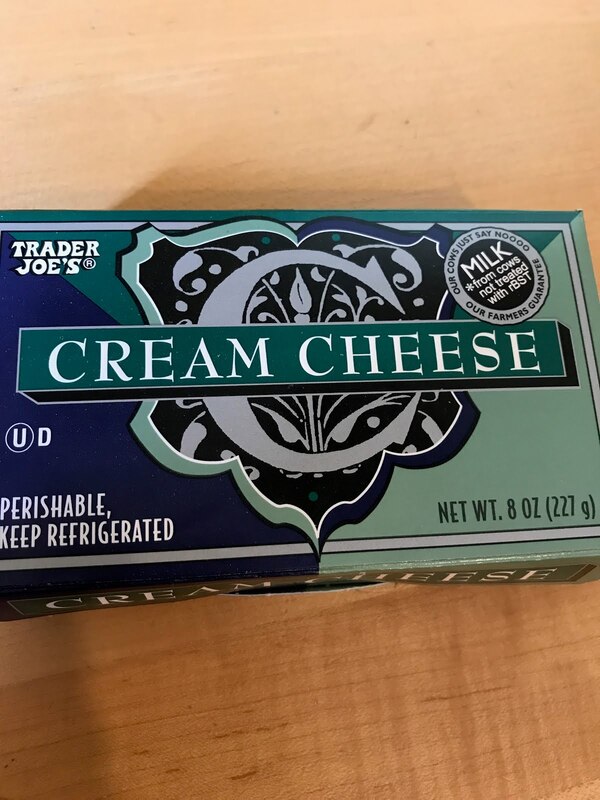 The cream cheese is really good and I love spreading it on a toasted everything bagel for breakfast. 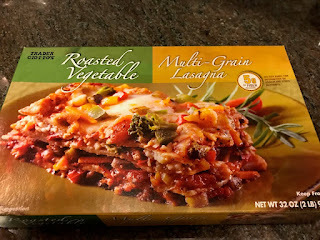 The last time I was at TJ's, I decided to try out the multi-grain lasagna and I was very happy and surprised at how good it tasted. You could see a lot of veggies in it such as the broccoli. 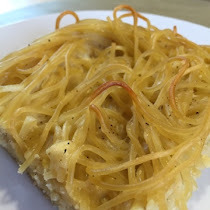 This was really easy to heat up in the microwave oven too. 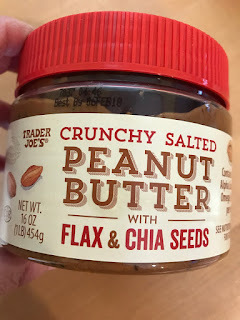 I occasionally like to make toast with peanut butter for breakfast, and when I do I just love this peanut butter as it has flax and chia seeds in it. 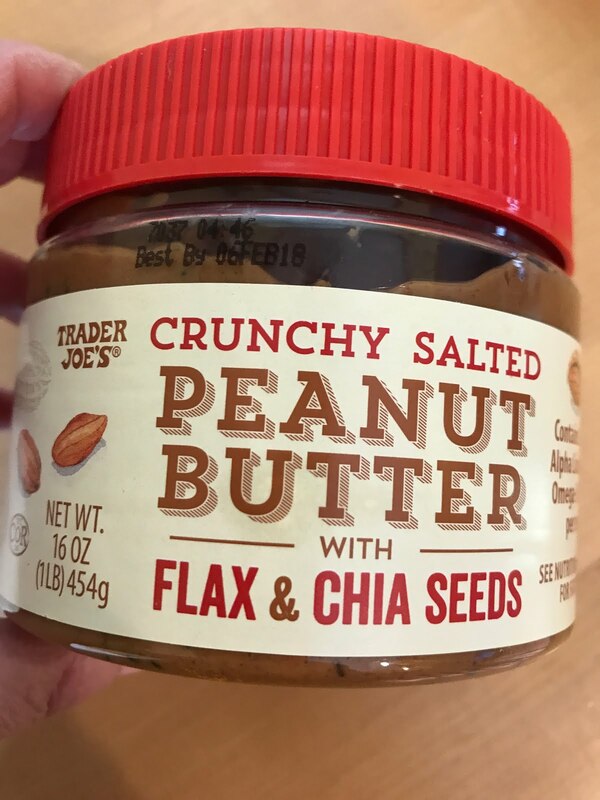 I love spreading this on TJ's sourdough bread. Oh, it tastes so good and yummy. 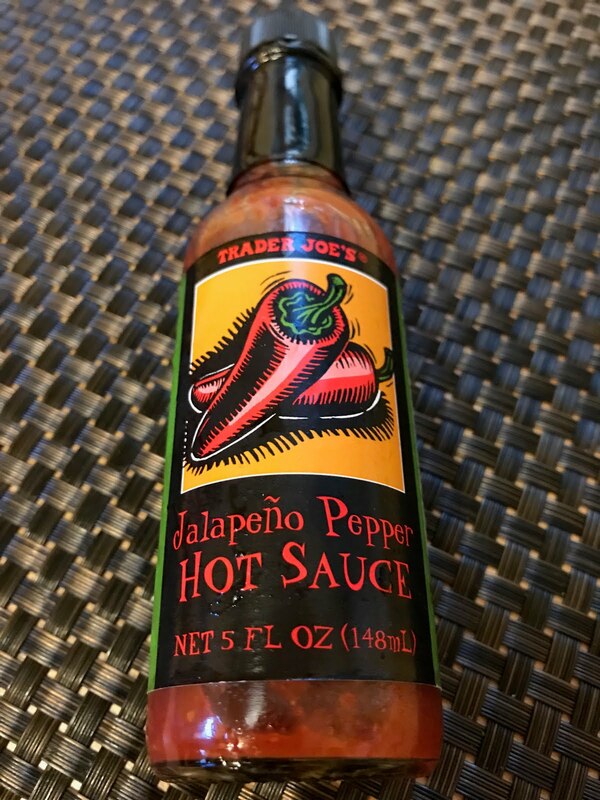 We recently bought the hot sauce on our last trip to TJ's and we love putting this on different foods. Some of you might remember reading about the blog post I did HERE on some of my favorite makeup. 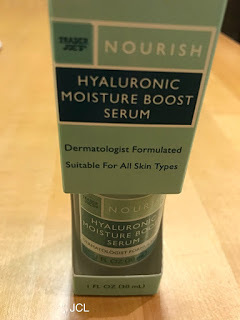 This moisture boost serum is a beauty product from TJ's that I really love using. It really makes my skin feel really soft. Have you tried any of these items at these stores? I'd love to know. By the way, this was not a sponsored post. I just love shopping at all of these stores! Yes, I love all three too. I don't get to WF much though. 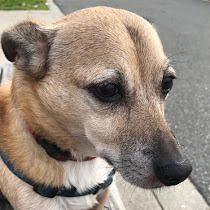 I will look for those Costco products, they sound good! 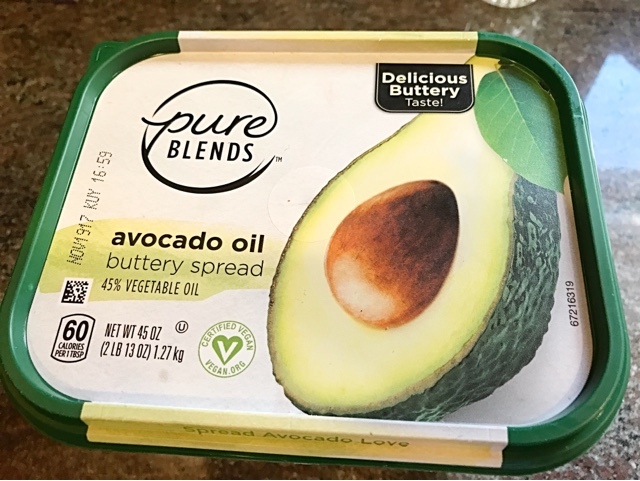 TJ's is a favorite as you know and I love discovering new products there. That lasagna looks so good. Their sourdough is the best! Can you believe that I never to go to any of those stores?? I know, I'm way behind the times, but I'm boring. I like my little grocery store in town. It's small, I know all the people that work there and I can get everything I need. I probably should break out a little and try some of the bigger shops!! The stuff looks good!! I've never shopped at either of those stores. We live in a small town and the closest Costco is two hours away. I can see why you love shopping there with all the new products they carry. I don't like unloading the car either. That's the part that's not so fun. 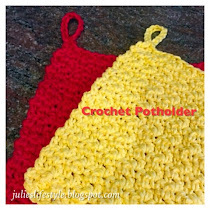 I love seeing some of your favorite products from each store, Julie. I don't get to Costco that often, but do love shopping there. I like crunch on my salad, too, and I'll check out that salad topper. I don't shop at Whole Foods because it's not close, and too pricey for me. I love TJ's, and it's not that close either, but I'm going to look for that face serum. I do love shopping there and trying new things. I'll have to look for some of these things on my next trip to Costco. I love their meat - we don't eat meat often, but when we do, I always get it at Costco.